DIY Kit helps organizations and communities prepare to serve dads: National Fatherhood Initiative (NFI), the nation’s leading provider of fatherhood skill-building materials and training, has released the Father-Readiness Training Kit™, a new do-it-yourself kit to help organizations and communities prepare to serve fathers. The kit captures over 15 years of NFI experience in training organizations on how to implement low- and no-cost strategies and tactics to engage fathers and to create an environment that supports successful fatherhood services and programs. To develop a field-tested and field-ready set of tools, NFI’s fathering experts drew from NFI’s experience running the federally-funded National Responsible Fatherhood Clearinghouse and several national and state-level fatherhood initiatives. In many communities across the country, there is a dearth of services available to fathers, often in communities where services for mothers and children are abundant. “Father-Readiness” is a process implemented by an organization, group of organizations, or group of community leaders to create an environment that increases father engagement. Accordingly, the Father-Readiness Training Kit™ helps organizations address the barriers to creating and implementing effective services for dads; undertake the foundational work necessary to create a supportive environment for programs; and address the five Ps: Proper Planning Prevents Poor Performance. comprehensive set of planning and implementation documents to conduct and evaluate the father-readiness training and process. 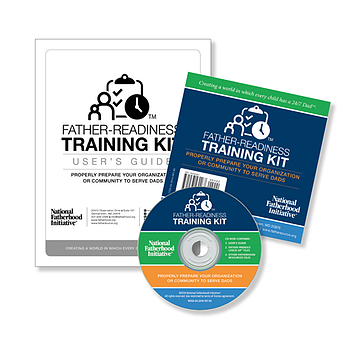 Through August 15, 2014, the Father-Readiness Training Kit™ will be available at an introductory price of $759 through NFI’s FatherSOURCE resource center. After August 15, the price will increase to $999.